:Your spiritual inheritance - reserved especially for you - is awaiting your full obedience. It only comes when you submit to God?s authority. Juanita Bynum explains the pattern for receiving - and not squandering - the mantle of anointing from God in Walking in Your Destiny (formerly titled My Spiritual Inheritance). Discover how accepting instruction and correction from spiritual authority can draw you into His incredible plan for your life. 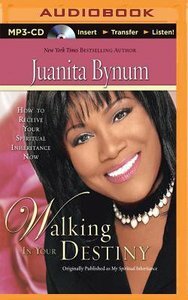 ?Juanita Bynum, with personal illustrations and examples from prophets, priests, and kings, points the way to your divine destiny.? - John Hagee, Senior Pastor, Cornerstone Church, San Antonio, TX ?As God?s children, we must be confronted with the fact that there is power in obedience. Compliance is vital to your walk with Him.? - Juanita Bynum Get ready for change. It is time for you to step into your God-given destiny and discover all that He has for you! About "Walking in Your Destiny (Abridged, Mp3)"